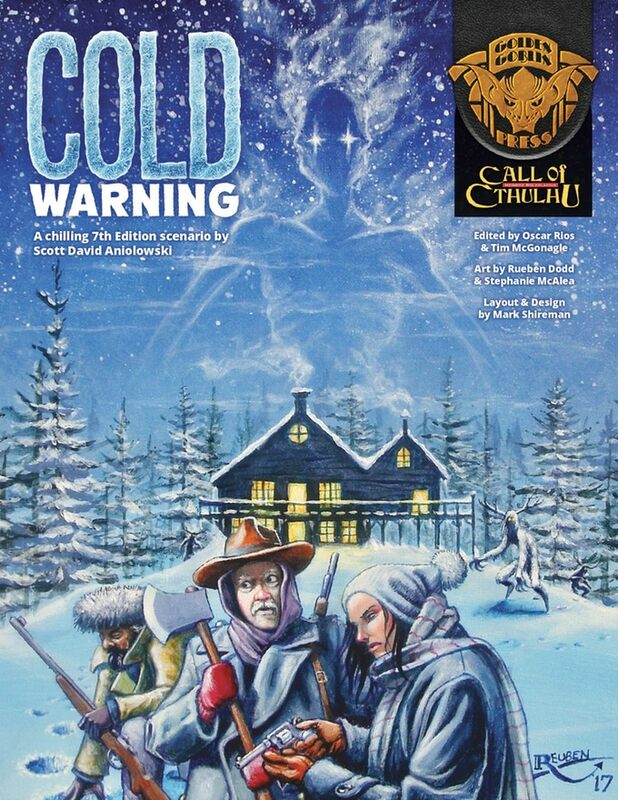 Cold Warning: A chilling 7th Edition scenario by Scott David Aniolowski is the first single scenario published by Golden Goblin Press, a publisher best known for anthologies such as Tales of the Crescent City: Adventures in Jazz Era New Orleans and Tales of the Caribbean. Released following a short, but successful Kickstarter campaign, the scenario is designed for use with Call of Cthulhu, Seventh Edition and is set in its classic period of the Jazz Age, though it can easily to be adjusted to take place in the Mauve Decade of Cthulhu by Gaslight or the contemporary period of the here and now. Equally, it could easily be moved to another country with ease as all it really needs is for it to be winter somewhere where there is a hunting lodge. Despite Golden Goblin Press publishing the scenario for the first time, Cold Warning comes with a little history. It is penned by Scott David Aniolowski who has been writing Call of Cthulhu scenarios for some thirty years, starting with ‘Temple of the Moon’, co-authored written with Mike Szymanski, in Terror From the Stars and more recently having contributed to both New Tales of the Miskatonic Valley and More Adventures in Arkham Country from the late, lamented Miskatonic River Press. 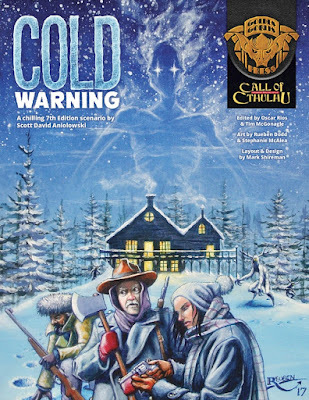 Cold Warning was written twenty-five years ago in the early 1990s and was originally intended to be included in the never published supplement from Chaosium, Inc., Amerikan Gothik. In the 2000s, there was the possibility that it would be published by Miskatonic River Press, but Golden Goblin Press has inherited it and following a rewrite by the author, has finally brought it to print. Opening in Arkham in February, 1927, at the start of Cold Warning the investigators are hired to find Marilyn Sutton, the pregnant widow of the late Joseph Sutton. His alienist, Doctor Trenton Harrod, believes there to be something more to Joseph Sutton’s unexpected suicide and wants the matter better investigated than that conducted by the Arkham Police Department. Alternatively, Marilyn’s family are concerned for her well-being given her recent loss and her pregnant state and hire the investigators to find her, or her physician, Doctor Ephraim Sprague, is concerned about some of the symptoms of her pregnancy and hire the investigators to find her. Although these two alternatives are given in the scenario—and the second of these lends itself to the possibility that investigators might be staff from Miskatonic University medical school, the default set-up in Cold Warning has the investigators hired by Doctor Harrod to find Marilyn Sutton and is written to that end. That said, the scenario is straightforward enough that it is easy for the Keeper to adjust its opening scenes to fit whatever introduction he wants to use. The investigators should quickly learn that Marilyn Sutton is staying with her brother-in-law, Stuart Sutton, at the family’s hunting lodge located in the woods north of Bangor in Maine. Fortunately, it being the midst of midwinter, the investigators will be pleased to find that the lodge hires rooms and has rooms, especially given that the increasingly wintery weather is drawing in as they arrive. The meat of the scenario takes place here, with the investigators exploring their surroundings—both the woods and the nearby separate, but forbidden guest cabin—and interacting with the few NPCs already staying at the lodge. These NPCs are nicely drawn and although some do veer very close to being clichés, they are quick and easy for the Keeper to roleplay. There are some nicely drawn connections between some of the NPCs too—if the investigators go looking for them that is. Barely a day will pass before events in and around the lodge begin to escalate in their weirdness and their ferocity and any group of players who are used to the sedate pace of many another investigative scenario is likely be shocked and quickly overwhelmed by said turn of events. More experienced players will quickly throw themselves into ferreting out what information they can in the increasingly isolated location. If this requires any one skill it is that of Stealth, but outdoors skills will also be useful if the investigators want to explore the area around the lodge. The Keeper is provided with a number of events to seed around the investigators’ movements and examinations, but Cold Warning comes to its finale with no little rapidity. There is a certain sense of operatic grandeur to this finale, set against the elements and an almost incomprehensible personification of the cold. At just thirty-two pages, Cold Warning is a short scenario, playable in a session or two, or even as a one shot. Given that length, there is a surprising lack of complexity to its plot, but this does not mean that it is without detail or sophistication. It may look straightforward enough, but under the hood there are elements and aspects that add pleasing hooks and twists to the scenario’s plot that is nicely enveloped in cold’s sharp embrace. Certainly there is more to some of the scenario’s NPCs than meets the eye and the Keeper should have fun portraying any one of them. The scenario will also make for a bracingly cold change of tone for the players as it takes place at a hunting lodge. If they decide that their investigators are not coming armed quite literally for bear, they really are missing the point. Of course, so far nothing has been said as to the nature of the threat faced in Cold Warning by the investigators. Given that it does take place in winter in the relatively far north and it does involve a Great Old One and his minions, veteran Keepers and players alike should quickly realise what exactly they are facing. Especially given that the Great Old One appears on the cover. There are some minor weaknesses to Cold Warning. One is that the introduction is slightly underwhelming with regard to exactly what Doctor Trenton Harrod wants. The other is that the map of the area around the hunting lodge needs more detail, in particular the location of the guest cabin and other nearby sites in the woods. That said, physically, Cold Warning is a well presented and well written book with some good handouts. Bar the area map of around the lodge, Stephanie McAlea’s maps are as good you would expect. Reuben Dodd’s illustrations though are very good. In previous volumes for Golden Goblin Press, some of his artwork has had a cartoon-like quality, but only one or two pieces suffer from that in Cold Warning. The standout pieces include the cover depicting worried investigators outside the lodge, a death scene inside, the shot of the NPCs, and the moment of the villain’s triumph. Given how good these illustrations are, Reuben Dodd would be perfect for illustrating a second edition of Beyond the Mountains of Madness. Whether as a chilling one-shot or a cold and bleak confrontation as part of an ongoing capture, Cold Warning manages to pack a lot into its few pages. A good, (frozen) solid scenario, Cold Warning: A chilling 7th Edition scenario is worth the author and the publisher having pulled it out of the deep freeze.